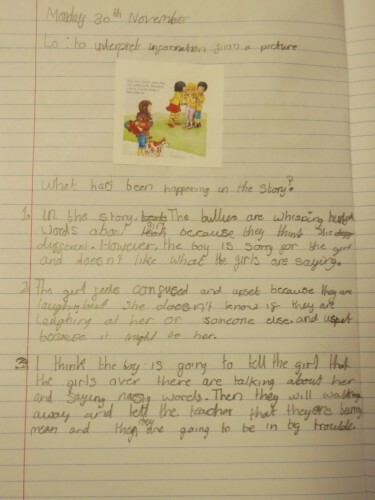 In guided reading, Mr Johnston set Year 5 a task to interpret information from a picture and write their thoughts on it, with small prompts to guide the children. They also used evidence to justify their opinions. 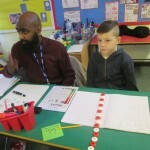 The class were very insightful in this task. Here is Brianna’s work from today’s lesson. 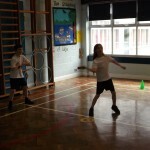 This afternoon Year 5 spent the afternoon looking at the topic of cyberbullying. 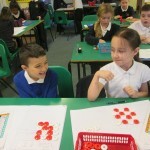 The class were very engaged in discussion. 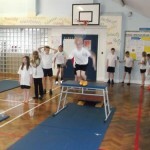 We looked at some case studies and a dilemma that the children in the video faced. 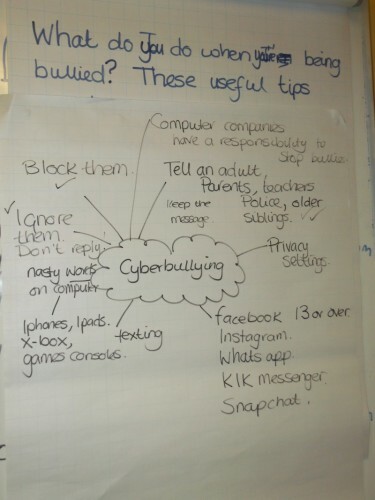 As a class, year 5 contributed ideas and wrote a piece about what advice they would give to someone who was being cyberbullied. 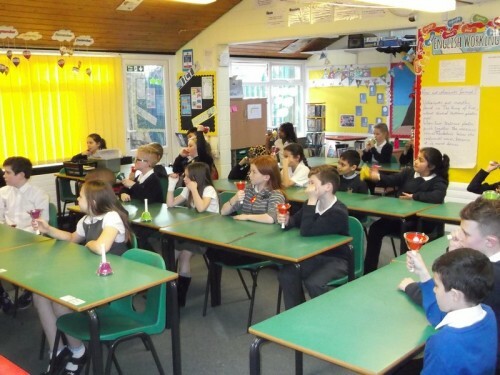 Last week, the Kestrels were lucky enough to take part in an “Explosions week” where the children learned all about how to make explosions by creating different chemical reactions using household items. 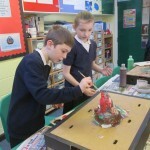 The items we used were fizzy drinks, bicarbonate soda, vinegar and mentos sweets. The class braved the really cold, wet and windy conditions and were very sensible in carrying out their explosions. Well done! In preparation for the Christmas carol concert, Mr Gill has been teaching year how to ring bells to create traditional Christmas carols. Year 5 have been doing extremely well and the carols are sounding fantastic already! It has been important to concentrate and know when to play your bell at precise moments. 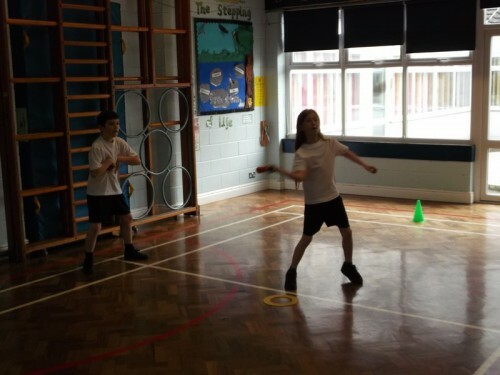 Year 5 have demonstrated this well and show they can tricky instructions in these Music lessons. They have been learning Silent Night and Away in a Manger. It’s a great way to end the week! 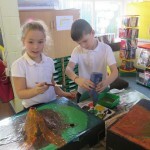 Today the children have been painting their volcano models. 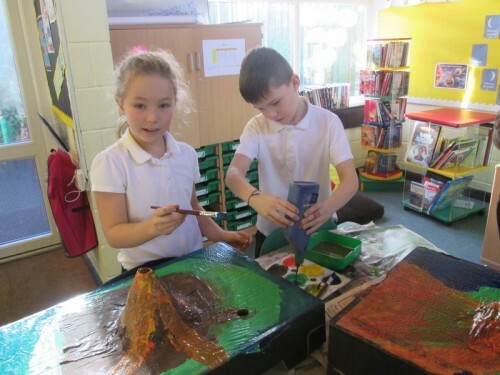 They had to paint on the features of the volcano and mix their own colours if they were not available. 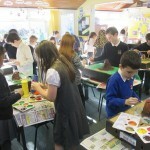 Well done year 5, these will look great when we make them erupt! 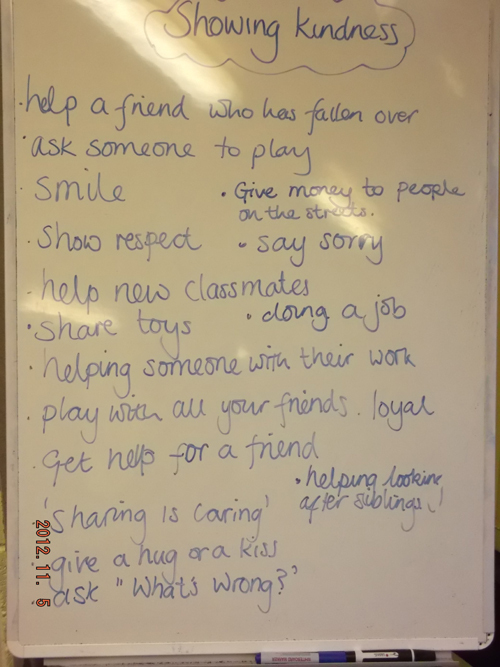 Today Year 5 having been looking at kindness in their PSHE lesson. 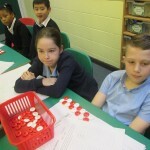 As part of anti-bullying week we have discussed developing positive attitudes. We looked at the different groups that we belong to: friendship, school, community, family and faith groups. These all have such a positive influence on our daily lives. 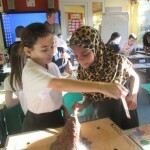 Year 5 had some wonderful discussion points! 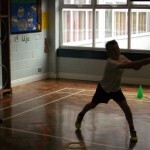 In this week’s PE lesson, Year 5 were treated to a game of indoor rounders with Mr Gill. 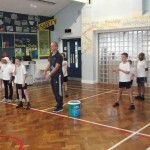 All children played very fairly and put in a great deal of effort to ensure their team gained as many runs as possible! 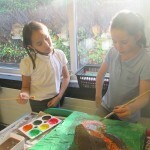 In this week’s topic, the Kestrels started to look at mountains. 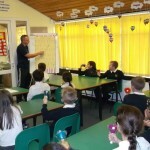 The class were shown by Mr Johnston, the three main ways in which mountains are formed. 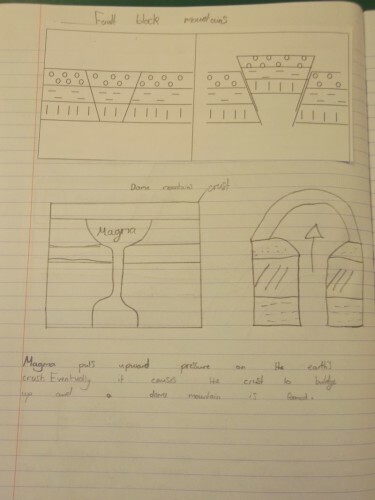 These are called dome, fault block and fold. 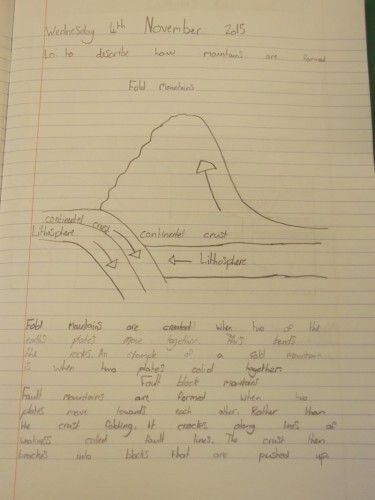 After Mr Johnston taught the class about each mountain, the children were expected to draw and describe how they were created. This is a picture of Joshua Black’s work. 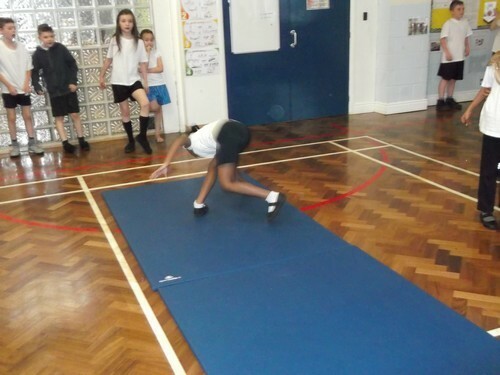 In today’s PE lesson, Year 5 continued Gymnastics with Mr Gill. 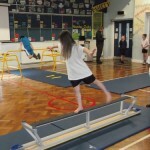 In the photos below, Briana attempted a cartwheel, Maisy did a balance on one leg and Kai Eaton did a star jump from a bench. Fantastic effort! 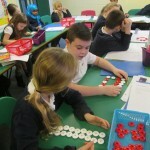 In Maths today, Year 5 were investigating factors of numbers using different representations such as arrays. 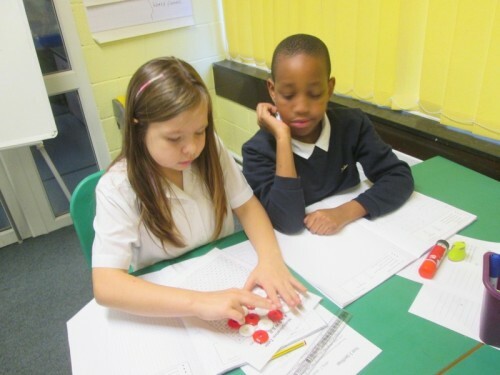 They did this using coloured beads to demonstrate these. 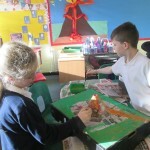 The class enjoyed this task very much as you can see from the photographs!